If you’ve shopped around for a chair from Charles and Ray Eames, even a reproduction, you’ll know you’ll be looking at a hefty price tag. So how about getting one in your home at a more affordable price – with these Charles and Ray Eames Chair Coasters. 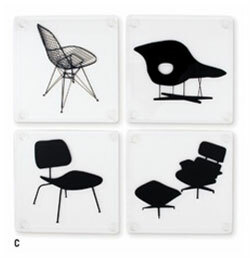 There are four coasters in the set, each featuring a key Eames design and made by and for the Museum of Modern Art. You can buy them online, priced at £15.